IRELAND’S TWO LARGEST parties are neck and neck in terms of public support, according to the latest opinion poll. In terms of leadership support, Fianna Fáil’s Micheál Martin is by far the most popular, with 52% of the public support. In his last poll as Fine Gael leader, support for Enda Kenny was at 37% – his highest ranking in the B&A poll since April, 2014. The survey of 938 people took place between Thursday 25 May to Tuesday, June 6. Most of the interviews were conducted before Leo Varadkar became Fine Gael leader. In terms of support for the other parties, Sinn Féin remained unchanged on 18%, while the Independent Alliance and Labour were up one point each to 6%. Renua scored a zero in support. There is a margin of error on three percentage points in the poll. Email “Fine Gael and Fianna Fáil neck and neck in latest poll ”. 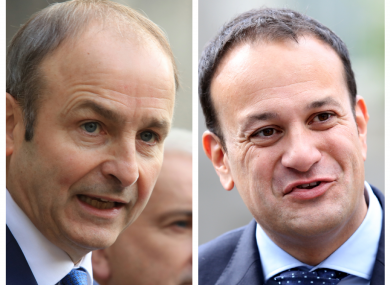 Feedback on “Fine Gael and Fianna Fáil neck and neck in latest poll ”.